Second Installment of Highway 80 Rivalry Goes OT For 76-68 LeTourneau Men’s Basketball Win. LONGVIEW, Texas – LeTourneau narrowly escaped with an 85-84 win in Marshall back in January, the team would need overtime to push past East Texas Baptist University by a final score of 76-68 at Solheim Arena on Tuesday, February 12. LeTourneau now sits at 17-7 overall and tied for first in the American Southwest Conference East Division at 13-4 while the Tigers slipped to 12-12 overall and 8-7 in the American Southwest Conference. Points would be at a premium throughout much of the first half as both teams would have trouble finding any rhythm in the opening six-plus minutes of play. After seeing East Texas Baptist take a 6-3 lead, LETU would pull back within one at 6-5 before closing a three-point gap to one at 8-7 with 14:32 remaining. A 7:34 scoring drought by LeTourneau allowed ETBU to take their largest lead of the game at 19-7 but would be cut in half less than a minute later as Nate West would connect on a three and was followed up by three Justin Moore free throws. The Tiger lead would jump back out to 11 at 24-13 before seeing back-to-back triples from Andrew Eberhardt and West keep the YellowJackets within striking distance as ETBU would keep the pressure on to try and stifle the LETU offense in the final four minutes of action. It would be LeTourneau who would crack down on defense and allow just five points to East Texas Baptist in the final 4:10 of the first half as the YellowJackets would use an 8-0 run to tie the game at 27-27 before a last-second jumper would give the Tigers a 29-27 halftime lead. More offensive woes by LeTourneau saw ETBU score nine of the first 11 points of the second half as the Tigers would threaten to push their lead back to double digits before a Caleb Loggins jumper and Eberhardt three cut the deficit to 38-34 with 14:53 left in regulation. The LETU run would continue with West getting in on the action from deep to pull the YellowJackets within one and eventually give LeTourneau the lead just minutes later on a triple with 11:22 remaining (42-41). Five straight points by East Texas Baptist put the Tigers back on top by a score of 45-42 with just over eight minutes remaining before a pair of Seidl free throws and Eberhardt corner three put LETU back on top with action starting to pick up heading into the final stretch of the second half. LeTourneau would manage to hold leads between one and three but could never indeed break the game open as the Tigers would have an answer for each LETU shot to eventually take a 54-53 lead with just 3:02 remaining. The YellowJackets would respond with a Seidl layup and West three to take a four-point lead just over a minute later but would see ETBU once again have a response by hitting a three of their own before forcing a defensive stand to get a shot at the lead with 43 seconds remaining. A foul on the low block would give East Texas Baptist a one-and-one opportunity as Jacob Owens-Bush would connect on the first and miss the second to leave the door open for the YellowJackets tied at 58-58. Following a LeTourneau timeout, the YellowJackets would see a Loggins 15-foot jumper hit the back iron to send the game to overtime. Experience in extra-time would not seem to make a difference as LeTourneau would be playing in their first overtime game of the year but jump out and trade two-point ETBU buckets with three-point makes from West to take a 67-62 lead halfway through the five minutes in the period. Moore would get a driving layup to give LeTourneau a seven-point lead at 69-62 with 1:45 remaining as the YellowJackets would go seven-for-eight at the charity stripe in the final 1:05 to ice the game and sweep the season series. 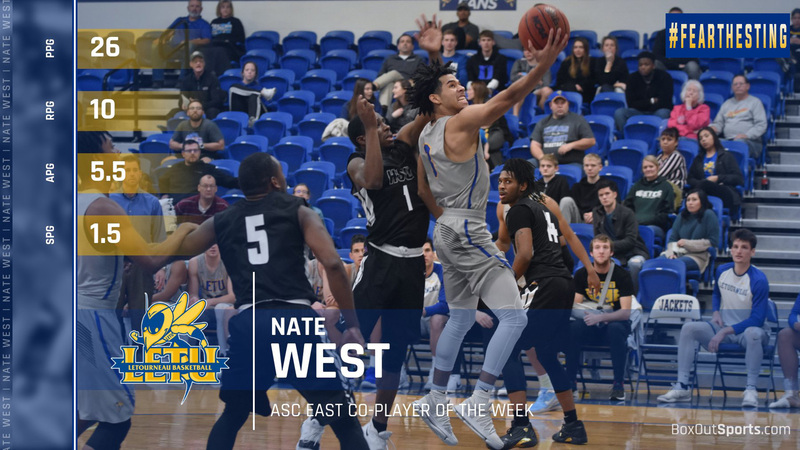 Adding to his ASC-best 23.6 point per game scoring average, West would score 11 of his game-high 32 points in overtime while adding seven rebounds. 30 of West’s points would come from behind the arc with the final two points coming to an end the game at the free throw line. Finishing the game with a 34.3 percent average from the field (24-of-70), LETU would make the shots when they counted most by going four-for-four from the field in overtime and missing just a single free throw to score 18 points in the extra session. 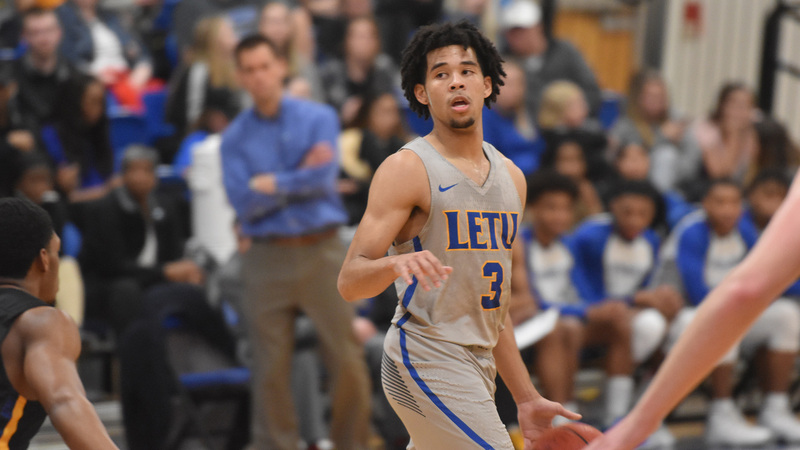 Points off turnovers (32-18) and fast-break points (22-1) proved to be the most significant factor in the game for LETU as the Tigers would hold a 42-34 advantage on the glass. LeTourneau will look to grab momentum heading into the American Southwest Conference Tournament by taking on Texas-Dallas in the regular-season finale on Thursday, February 14 at Solheim Arena. Tip-off is slated for 7:30 p.m. and will be the final regularly-scheduled game at home for five seniors (Seth Mattson, Chase Orlich, C.J. Bird, Caleb Loggins, and Christian Seidl) who will be honored before the game. LeTourneau Women’s Basketball Falls 65-48 To #13 East Texas Baptist. LONGVIEW, Texas- After facing just a four-point deficit following two-quarters of action, the second half would be too much to overcome as the LeTourneau University women’s basketball team fell to number 13 nationally-ranked East Texas Baptist University 65-48 on Tuesday, February 12 at Solheim Arena. With one contest remaining in their 2019 season, the YellowJackets move to 6-18 overall and 3-12 in American Southwest Conference play while the Tigers pick up their 10th victory in a row to improve to 22-2 overall and 14-2 in conference action. It was a slow first quarter as neither team broke double-digits until 1:45 remaining in the period when a Keauna Whitfield layup put the YellowJackets up 10-5. A triple from the Tigers at the end of the first quarter and a layup to open the second knotted the game at ten to set up a back and forth ending to the first half. There would be four ties and three lead changes in the final ten minutes of the first half, but the Tigers would lead 31-27 as a last-second jumper put them up by four going into the break. A hot Tigers offense stretched their lead to as much as 13 in the third quarter as the YellowJackets would see just ten points but managed to cut the deficit to nine as they headed into the final ten minutes of action trailing 46-37. ETBU would continue to pull away in the final period as they went on a 9-0 tear until an Alexandria Thorne jumper with 6:05 remaining cut the deficit to 55-40. With the clock winding down, the YellowJackets would see the final two points go in their favor but would fall short in the end, dropping their second game to the Tigers this season. A trio of YellowJackets saw double-digit numbers in the scoring column as Chauntel Acosta, Thorne and Whitfied combined for 38 of the YellowJackets 48 points. The Tigers would use turnovers to their advantage as they racked up 33 of their 65 points off of 25 LETU turnovers. Success from beyond the arc would be the difference maker for the Tigers as they sunk ten throughout the 40 minutes of action while the YellowJackets came up with just three. The YellowJackets will play in front of their home crowd for one final time as they honor two seniors (Sha’Donnaver Young, Claudia Moonsammy) in a 5:30 p.m. matchup against Texas- Dallas on Thursday, February 14. The Comets will enter Thursday’s contest holding a 10-game win streak with a 19-4 overall record.